ACRE is the offroad line of Mission Workshop, the folks who made their bones with well-designed apparel and accessories for the urban/commuter/messenger crowd. While the Meridian can certainly do city-riding duties, it is definitely designed with an eye towards getting dirty. To that end, the jacket is constructed of Schoeller c_Change®–a high tech fabric from Switzerland that seeks to achieve the winter jacket holy grail of (1) keeping the rain from soaking your skin and (2) simultaneously venting all that steam you're generating beneath the jacket. You can't, after all, stay dry if you are steaming yourself to death beneath a poncho with the breathability of a Glad bag. You may have noticed the price tag on this jacket and thought something along the lines of WTF?!? Yes, there's no getting around this point: the Meridian is a pricey mofo. Why? Two reasons come to mind: (1) the jacket is made in Canada, as opposed to the far East and (2) Schoeller c_Change® is seriously expensive to work with, and I'm talking caviar and Cristal expensive. 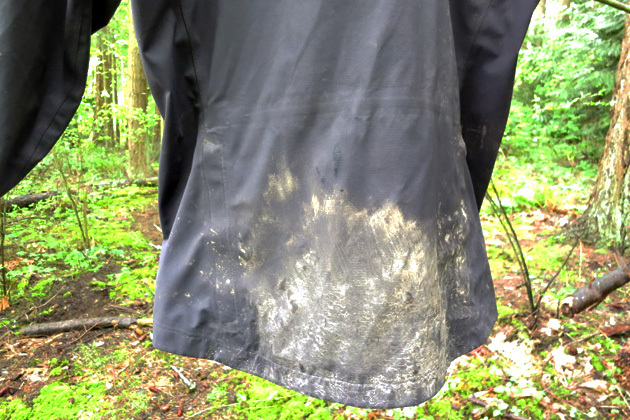 The ACRE Meridian’s long tail keeps mud from infiltrating parts of your body that mud just shouldn’t be infiltrating. Why, then, did they opt to make the Meridian out of the stuff? I'm guessing that it's because the Swiss seem to know what they're doing with this fabric. Schoeller c_Change® has a nice, light feel to it, with just the right amount of stretch. If the clouds part and the sun breaks through, the Meridian packs away in a very tidy lump. 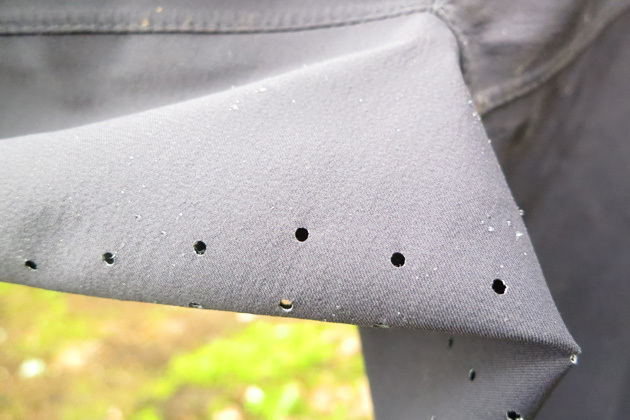 And when the weather goes sour and it absolutely dumps, the high-tech fabric does an excellent job of keeping you dry. The fully taped seams and sealed zippers also help in that regard. How breathable is the jacket? Quite good—I'd give it an eight out of ten in that regard. 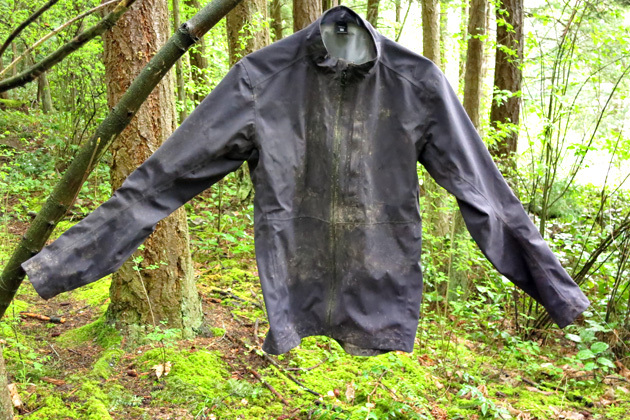 As was the case with the Sugoi RSX NeoShell, the folks at ACRE opted to forgo pit zips. The Meridian features laser-perforated, underarm ventilation, which helps to some degree, I suppose, but nothing vents like the great big gaping hole you can open up with a proper pit zip. I guess I'm flogging a dead horse on the pit zip front, but I'm a little saddened to see so many jackets veer away from having them, on the premise that the jacket doesn't need them since the fabric is so good at breathing. I've never ridden a jacket that breathed that well. Just sayin…. No pit zips here–the folks at Mission Workshop opted to equip the ACRE Meridian with lazer perforated underarms sections. While I'm nitpicking here, I wish the Meridian also had adjustable cuffs. Instead, the jacket's sleeves taper down so that you have a fairly tight fit at the wrist. The design keeps water and cold air drafts from working their way up your arms, but I'd prefer old-fashioned Velcro'd wrist closures—particularly when I'm wearing bulky gloves that don't pass easily through the slim wrists. 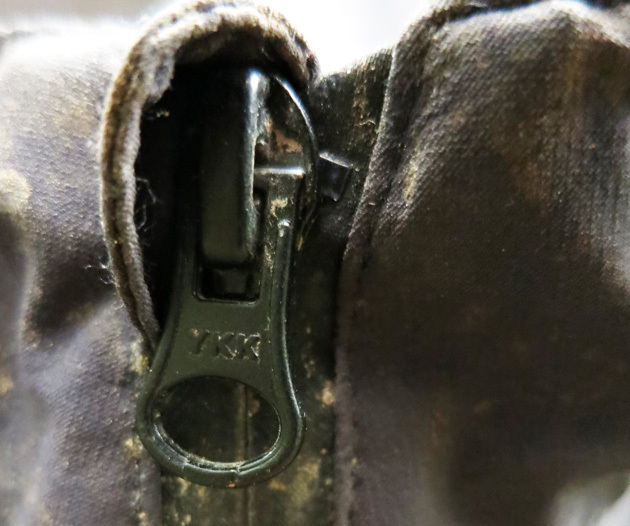 So many jackets feature tiny zippers which are impossible to grasp when you’re wearing gloves. The Meridian, on the other hand, rocks fat YKK zippers. Nice. The Meridian features two chest pockets that sport media player ports (nice) and a huge, zippered back pocket that'll accommodate a hat, energy bar, or 12-inch slab of vinyl. In short, despite the jacket's very minimalist cut, there's actually a fair bit of storage hidden in the thing. Having said that, I'd have preferred some hand pockets, which would make accessing frequently-needed goods, such as your multi-tool, a bit easier. Finally, the Meridian is not equipped with a hood—that's not a deal breaker for me, but at this price point, I think a lot of riders are going to want the kitchen sink, the works and a bag of potato chips to boot. Is the Meridian the right jacket for you? The top-tier price tag will keep some people from even considering it, but the ACRE has few equals in the "waterproof yet breathable" arena.